Bali, September, 2013. Earlier this month, Samabe Leisure Group had the honor of hosting a reputable Chinese artists group called China Oriental Performing Arts Group Co. Ltd. (COPAG). 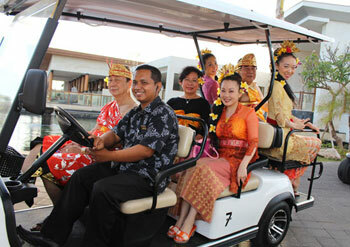 The group came to Bali for a visit in between their tightly scheduled performances in several cities in Indonesia. COPAG is a Chinese national performing arts group comprising several Oriental art troupes, ranging from song and dance, musical ensemble, vocal, symphony orchestra, and stage art. As many as 32 personnel from the group – dancers, singers, art director and crew – were invited to Indonesia to showcase their talents in Surakarta and Surabaya. The artists stayed in Grand Mirage Resort & Thalasso Bali, a five-star Bali beach resort in Tanjung Benoa, and had a series of activities, such as water sports offered within the resort, and tours to Tanah Lot and Ubud. One of the highlights of their Bali getaway was their visit to Bali Nusa Dua Theatre to watch the amazing 90-minute performance, "Devdan, Treasure of the Archipelago". As performers themselves, the Chinese artists' troupe appreciated the highly technical show that has been regularly performed for over 1.5 years. The Art Director of COPAG expressed his impression after the show, saying that he was ecstatic to be able to watch a modern theatre that puts forward traditional Indonesian arts in a contemporary light. The different traditional cultures brought up in the show had him taken away into the cultural richness of the country. "Devdan Show is definitely worth seeing," he said. The Chinese artists and the Indonesian Devdan artists captured the moment together in a picture. In their last evening in Bali, the star-studded artists company visited Samabe Bali Suites & Villas, the newest collection of Samabe Leisure Group, located in the luxury side of Bali, Nusa Dua. Mrs. Lindratini Suparsono, owner of Samabe Leisure, hosted an afternoon tea by the main pool side of the luxury beach resort. To make a lasting memory in Bali, the guests dressed themselves up in traditional Balinese outfits and took pictures against beautiful backdrops of the resort. After inspecting some of the suites and villas, they enjoyed the magnificent views of the Indonesian Ocean from the lounge area in the pool side, while savoring canapés and a variety of drinks. The artists group, which once played an important role in reforming the Chinese cultural system and is considered "Cultural Ambassadors" of the New China, returned to Grand Mirage Resort to have their last dinner in Bali before continuing their road show in the following day.